Update- April 2009- This piece has reached the 2009 Bead Dreams final. A beaded necklace made up of geometric components which incorporates 3 different crystal shapes and sizes, with cylinder beads in 2 different sizes. Each beaded component incorporates the geometric theme in both its outer shape and also the edging holding the crystal in place. There are five beaded stars which are made up of 6 components including a central pentagon encasing a Swarovski rivoli. Each star is hollow and you are able to see in and around the rivoli adfing depth to the piece. There are 10 square components, each holding a square flat-back crystal. Each component is joined to the next using a jump ring. The necklace is finished with another square component which contains the box clasp fastening which is hidden by beadwork and used to close the necklace. 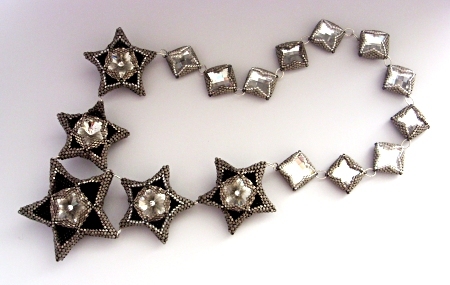 Instructions for the smaller stars and squares used in this necklace are now available.